With the on-coming summer a few new migratory birds are heading to Greens Bush for the warmer seasons. 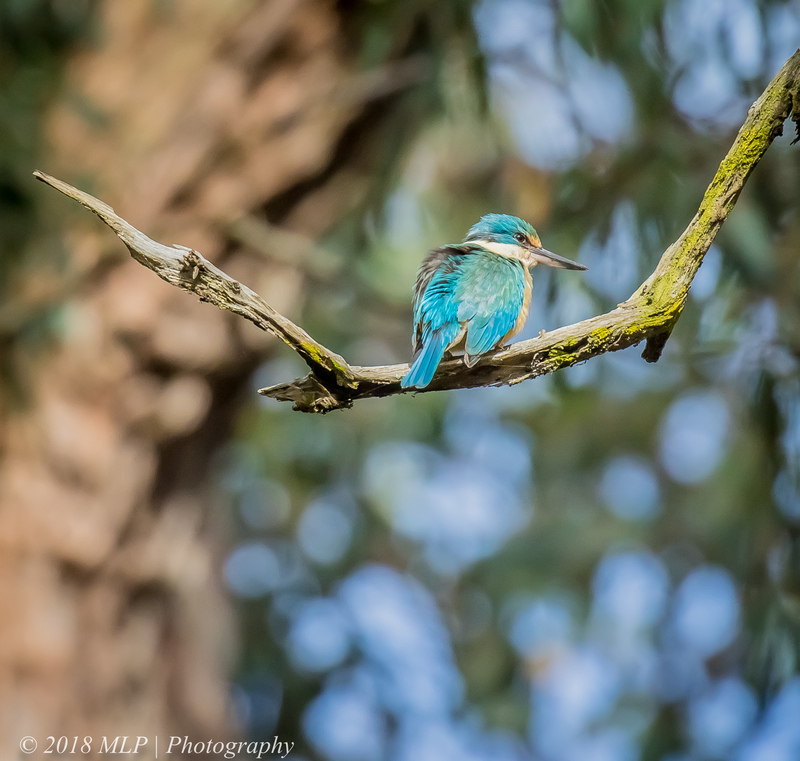 I heard recently the distinctive sounds of 5 short barks of the Sacred Kingfisher: a tiny bird in bright blue, hunting amongst the trees. 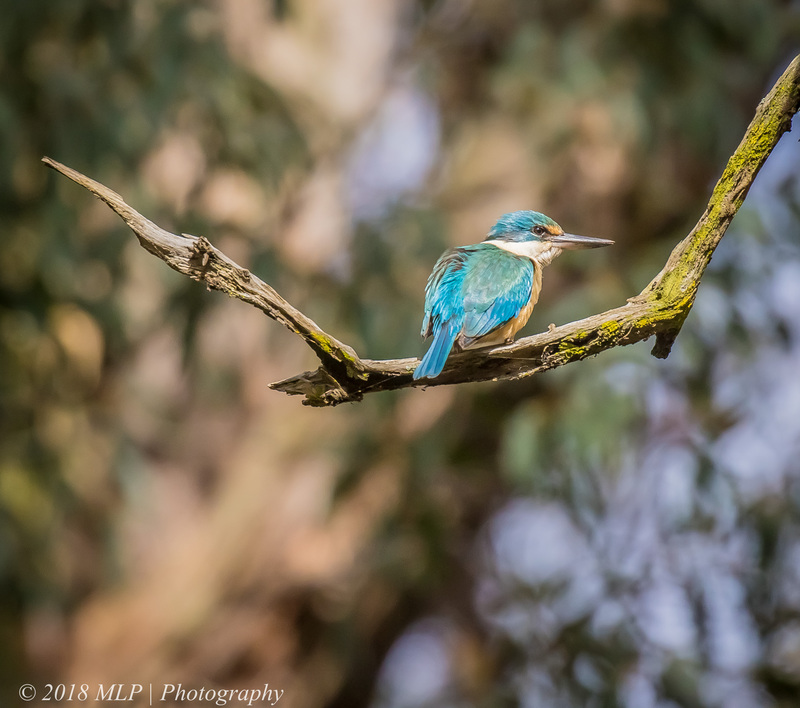 I only spotted the kingfisher after tracking its barks and seeing a flash of blue against dull brown tree bark. It seemed to be investigating all the nearby tree hollows and calling often. After failing to find the Tawny Frogmouth’s nest, I got a few more directions and went back the next night to Elsternwick Park (North) and found it. It was in an obvious position and quite visible when you knew where to look and what to look for. The nest was more robust using more materials than I seem this species use before. I photographed the Frogmouth from a few angles, waiting to see whether the nesting parent would open its eyes. I moved to the front of the nest and took a few images and checked the back of the camera looking for clear shots and exposure when I noticed two yellow eyes looking out at me from the parent’s belly. Turns out the chicks had already hatched and were quite large. I only saw one chick moving about and it was quite curious about me. At one point it even had a good stretch of its wings. After a few shots I left them in peace to enjoy the late afternoon and get ready for evening’s hunting. Tawny Frogmouth with chick stretching its wings. I heard from a friend that there were nesting Tawny Frogmouths at the old Elsternwick Golf Course, now formerly called Elsternwick Park North (and wetlands). I spent some time looking for the nest with no luck. But I did find one of the pair roosting nearby. He was very relaxed and wasn’t by bothered by me at all. He did open his eyes and watch me for a minute while I stumbled around a bit trying to get a clearer shot below him. As it was dusk the sun was right in the worst possible position. These are one of my favourite birds, nocturnal, unafraid, and sit still for a photography to go nuts. They are also invisible to most eyes unless you are looking for the grey coloured lump in a tree that does not quite belong. I often drop into the Quarry Reserve in Moorooduc to check in on the Peregrine Falcons that make the flooded quarry their home. In the surrounding bushland are many bird species working hard through their breeding cycles. I watched a pair of Brown Thornbills searching for insects amongst the scrub and was surprised to see a Cuckoo seemingly working the branches with them. It even hopped to the ground and rummaged amongst the leaves. Occasionally it would stop and make the typical Shining Bronze Cuckoo calls. I am sure that the Thornbills had raised this cuckoo. I was watching a Bassian Thrush move along the path collecting worms for a return to the nest. It would occasionally drop all the worms, pick up an irresistible insect of some sort for a snack and then one by one pick up all the worms and move down the track. It had 6 bigs worms in its beak and after a few minutes ducked down a side wallaby track. I stood still and tried to see where it would go so I could find the nest. A meter or so from my face an Eastern yellow robin flew to a branch and hopped into a nest. I had no idea it was there but after standing still for so long it seemed to not see me as a threat. I slowly moved back to the other side of the track and took a few pics. After several minutes she flew off and I took few pics of the nest. Robins have amazing nests made with soft bark strips and then covered with spider web and live moss and lichen. There has been a lot of media lately about local magpies diving bombing posties and kids going to school. A friend even had a nasty scratch on her face from an attack. I have lived in my area for many years and have never been bombed by the local maggies. I have read that they are very territorial but can actually recognise human faces in their territories, up to 25 distinct people. To play it safe when I walk past a magpie in the streets around my house I take my hat off and give them a clear view of my face. I have done this since I read the article on facial recognition. I reckon it works. I photographed this female (or juvenile, a mottled grey back indicates a female or juvenile) while walking my dog yesterday. She gave me a good long look and then went back to searching for grubs and other tasty morsels in the grass below a pedestrian bridge over the creek behind my house.